This one was a blast, despite having to draw so many figures. But the feedback was worth it! Did you know that apparently it’s a thing to dress up as MLM products? Me neither. So Todd and company decide to show off some proper Halloween costumes. We have Todd as the Deus Ex Machina guy, Benthessia as Witch Mercy, Marcella as 2B and Vash’na as Sylvanas. Also enjoy the Gatchaman reference, too! We have tons of subreddit references here, and all of the huns were from posts featured on the board during Halloween. Someone dressed up their kid as a Young Living oils bottle, as unbelievable as it sounds. 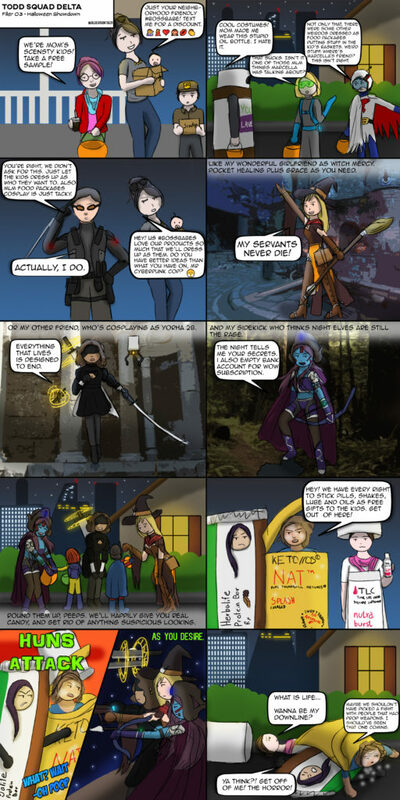 This is the comic page that got the most attention. With over 400 upvotes on Reddit, getting posted both in other subreddits and even a Facebook group, it obviously struck a nerve with people. If it was good or bad, I have yet to see. Now there was a censored version with this comic, and it was missing two frames of action. The subreddit was in a bit of a schism and I didn’t want the comic to feel like it was attacking anyone; but from the feedback I received, nothing was the matter and it was welcome. So I did the uncensored version a few months later. This came on the height of a wave of posts over there, mainly from reps telling various people that their oils would cure things. 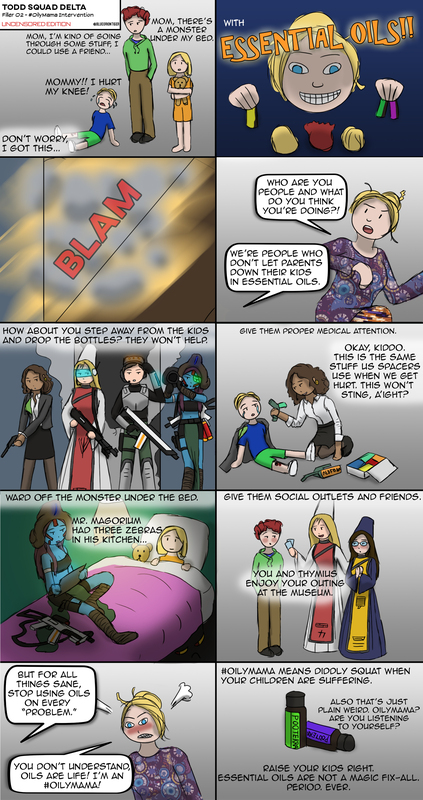 From telling parents that it’d make their disabled kid walk again, to applying them to large open flesh wounds, and even a nutty mom who tried to douse her teenage son in essential oils to “get rid of his rebellious and moody behavior.” The latter especially served as a template for the mom in the comic. Not much explaining here otherwise, but it was fun to draw the squad in combat gear; took me a bit to figure out what kind of weapon Benthessia would use, but I kitted her with a shotgun as a nod off to Yorina’s armament. So please enjoy. Our adventure continues! Vash’na explains why she wanted to call starbase security on the hun. Some of her species backstory comes to light, and we get to the end of the introductory arc, ready to make their foray on Earth! I had gotten some feedback from the guys at Anti-MLM Coalition with this panel, and had to cut on some of Vash’na’s species backstory. It honestly needs to be told to get a big picture of what’s going on, so maybe one day I’ll make a regular article then link it here. While this is set in a sort of alternate universe, the general history is the same. Special thanks to Christina Weinman for the lineart of the 5th panel! You should have a bit of fun with this page! I get to delve into my Kashri species a bit, so enjoy. 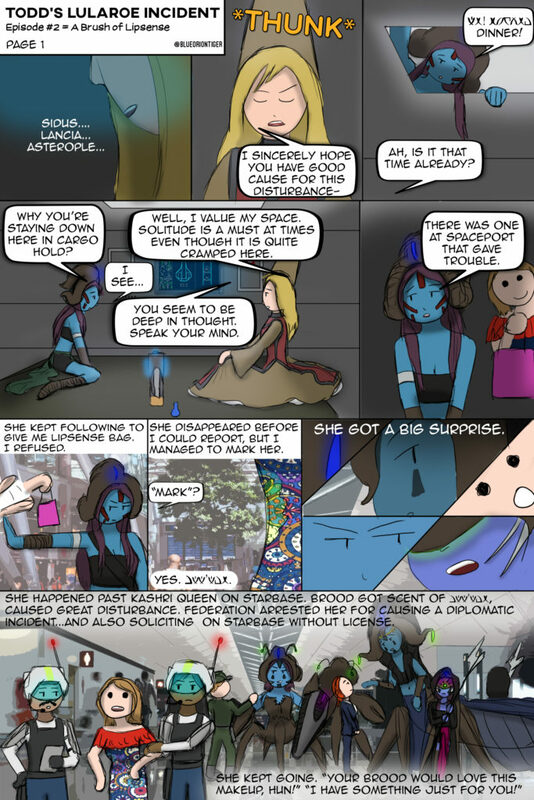 While their meetup went well, Vash’na tells Benthessia about her encounter of a hun, which ends up resulting in her getting arrested by starbase security. At least we get a win, right? 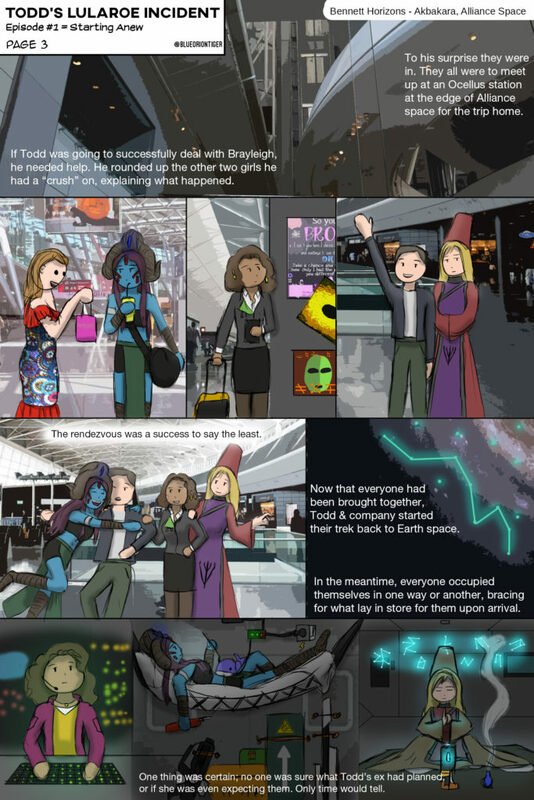 This page drew from inspiration of two particular posts that was floating around the week I drew this; one user talking about Lipsense people at an airport, and another was a user who censored a face when talking about an LLR botique. So those two got incorporated into that. Vash’na came out real well here for some reason. All her face markings were spot on. I think at least 2/3rds of my time on this comic is being spent on backgrounds. Someone on Reddit made the comment that it’s not wasted, however. I set the tone and scene really well! So there’s that. I decided to give Todd and Benthessia the other companions from the first comic, and let them come along for the ride. More people for the readers to love, right? You can tell I had fun showing these characters linking up with each other. And yes, Benthessia meditates, Vash’na has a plush whale and those are space guns below her. First, voting results. Benthessia was the winner by one vote! Everyone else was a tie in at second. That was a shock for me, and while I process what to do with that revelation, will plug ahead as promised. Todd now has a lovely Notikan women to stand by his side and help him out in the challenges ahead. I spent a huge amount of time on the cockpit and the homeworld panels, but I really wanted to hammer what the Notikan homeworld was like. As much as I’ve written it by myself and want to portray in Dawnstar one of these days, I had to actually come up with something to show how their world looked. I finally settled on something partially ancient and a little regal, as a herald to their ancient Latin-like roots. But Brayleigh, Todd’s ex-wife rears her ugly head upon seeing that Todd has a new friend. Looks like he has his work cut out for him. 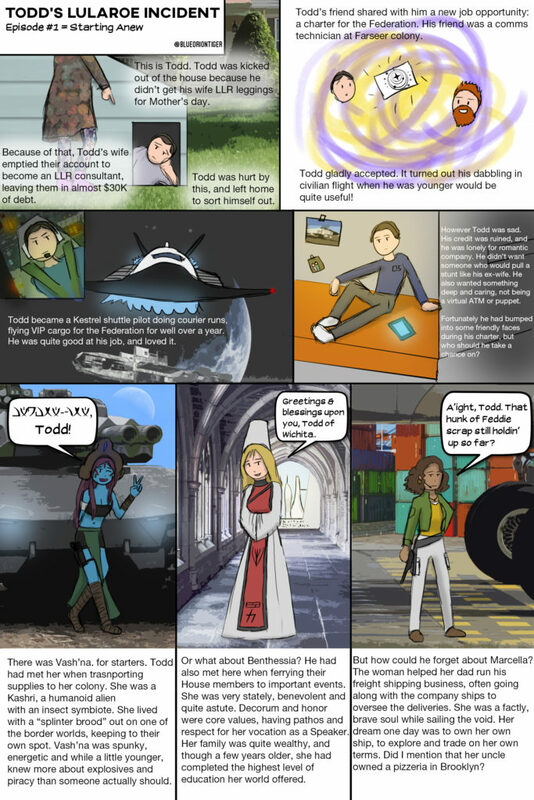 So this is a project I took on after seeing some stuff over on r/AntiMLM, but you can say that this would be my first full-developed comic for quite awhile! I definitely don’t plan to stop this series, so hang in there and I’ll keep putting pages out. I actually have this on a vote, and the peeps over there get to vote who becomes Todd’s girlfriend, along with some general story plots and directions. You’ll see some of that reflected in the second page when it comes out. 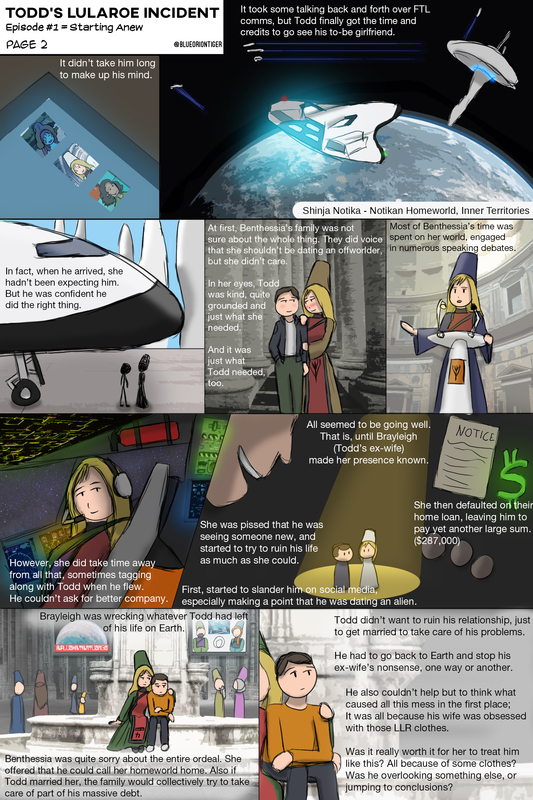 And yeah, those text boxes kind of burn the eyes; I’ve never done a comic page before; I’ll get better as I go along.